Be Free of Laundry Detergent Forever! Never Buy Laundry Soap Again! The average family spends upwards of $20 a month on detergent so a Magnetic Laundry System you could save you up to $240 per year! In 3 months your Magnetic Laundry System could pay for itself. How does the "Magnetic Laundry System" Work? Constructed with special permanent magnetic materials calibrated for a washing machine, it's a simple application of technologically advanced materials, originally developed for NASA's space program. 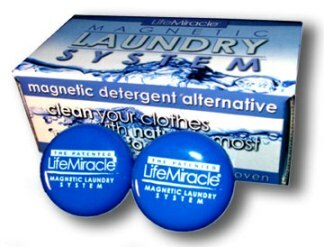 The Magnetic laundry System uses specially calibrated permanent magnetic balls, to alter solvency. When water, or any stream of atoms, enters a powerful magnetic field, it physically changes in the same way atoms change when run through particle accelerators used by physicists. In effect, the water is ionized as negatively charged oxygen ions are stripped from stable water molecules and freed to perform a number of tasks. Among other things, the altered water can dissolve scum lines, help stabilize pH, kill algae and microorganisms, and release stains and odors from fabrics. Water is a uniquely polar molecule, like a little magnet. Its polar nature allows it to dissolve almost anything. In fact, water is so good at "solving" other materials that it is often called the universal solvent, and being such a good solvent you would expect that water alone would be a good cleaning agent - and you would be right. The only problem is that water sticks together. When you think of water you think of two hydrogen and one oxygen molecule, but actually water is more like 20 hydrogen and 10 oxygen. Back in the 1970's, superstructures of water were both theorized and discovered. The same polar nature that makes water a good solvent, causes water to stick to itself and form large superstructures. The problem is magnified in hard water where water amalgamations give water unique properties like tremendous service tension (watch a bug walk across the surface of water) and great resistance to evaporation. These superstructures are too large and too preoccupied to be valuable cleaning agents, so the way to change the actual physical characteristics of water is to pass it by focused magnetic fields. Since opposites attract, and water acts magnetically; passing water through a series of magnetic fields pulls it first one way and then the other. The forces tugging on the individual water molecules will break up the superstructures and create smaller individual water molecules. Some people call this process restructuring. These small, polar water molecules can then slip easily into fabrics, carpets, etc. dissolving and removing dirt and stains without chemicals. The electrons spend more time around the oxygen and less time around the hydrogen, making it positive. The permanent magnets create a powerful magnetic field that aligns the water molecules (hydrogen in one direction, oxygen in the other). This alignment drastically reduced the "surface tension" of the water. This results in the "drops" becoming much smaller so that they can easily penetrate the fabric. In addition, by polarizing the water droplets we increase their "free-charge", allowing dirt to be grabbed and easily removed from the garment. When this happens, the water is considered "activated". Along with this process, the minerals and salts suspended in the water, become activated into an "ionic" form (charged particles), aiding in the cleaning process. It sounds simple and it is, however simply waving a magnet over a cup of water will not create a cup of cleaner. Researchers found that the position and strength of the magnets, as well as the size of the magnetic field is critically important. Their efforts led to the development of the Magnetic Laundry System, a virtually indestructible water restructuring system, that lasts a lifetime. Better than chemical laundry soap! The average home contains 25 gallons of hazardous chemicals including formaldehyde, phenolic and chlorine compounds, all found in detergents. Detergent ads tout the clean smell clothes have after using their detergent, but it's not clean - it's perfume. Clean clothes have no odor impregnated clothes. When the perfume is absorbed by the body it can spell trouble in the form of environmental sensitivities. Some of those red eyes and runny noses are not because of allergies, but due to the perfume and detergents left behind in our clothes. For more than fifty years, detergent makers have been collecting your money for toxic chemicals that aren't as good at doing what our Magnetic Laundry System can do without the use or purchase of any chemicals. Detergent chemicals simply change the molecular structure of water so that it becomes "wetter" since they also know that lowering the surface tension ofthe water, allows it to clean better. We've discovered that you can achieve the same results with magnetic technology using no chemicals whatsoever! The Magnetic Laundry System changes the molecular structure of water by breaking the surface tension without the use of harsh chemicals. The magnets make the "water wetter" and then the water absorbs the dirt and soil from your clothes keeping it suspended until removed. Washing your clothes without the use of harsh detergents is amazing technology! Patent protection has been applied for, though we are not the first to understand the value of a magnetic field to change the molecular structure of water. The process of using magnets to reduce the surface tension of water is not new dating back many centuries, but we believe we are the first to do it this way. Instead of selling you vast quantities of harmful chemicals in an ongoing manner, we offer our magnetic hydro-nomic system that lasts forever! Soil Eradicator sold separately, is our citrus enzyme alternative to chemical stain removers like Spray-n-Wash.is an inexpensive, natural and chemical-free way to remove stains. To replace detergent, you need only the magnets. 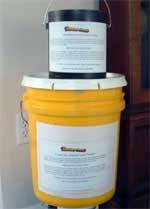 Soil Eradicator is an enhancement that is only beneficial or useful to remove difficult stains. That said however, you might find it worthwhile (as I do) to add an ounce of Soil Eradicator to every wash for an extra measure of cleaning and natural stain removal. Because the Magnetic Laundry System is such a powerful cleaning system the scum from the outer tub (that you can't see) is going to be freed when the system is in use, so before you use your Magnetic Laundry System for the first time, it's best if you clean the residual detergent scum from outer tub of the washer. The best way to do this is to put the Magnetic system balls in the washtub and add a gallon of white vinegar; then run a wash. You can run it empty but it's better to put in some old towels, rags or something you don't care much about, since these could end up being sploched with stains from the old detergent in your washer. It's best to repeat this procedure twice so as to completely clean out the washer in preparation of your first normal wash with the Magnetic Laundry System. As a substitute for chlorine, consider using white vinegar to kill germs. We found that there's no vinegar smell after the rinse cycle, but try it and decide for yourself. Because the Magnetic Laundry System magnets are such a powerful cleaning technology, they will remove detergent scum from everywhere in the washer and your clothes might become blotched with the scum that is coming from the tub. If this occurs, try washing them a few more times with the Magnetic Laundry System to see if they become clean again. Just keep using the System and you won't have to repeat the tub cleaning procedure ever again. Simply drop the two balls into your wash tub and start washing. The Magnetic Laundry System replaces detergent. Dirt and grime contains iron filings that will collect on the balls, so it is a good idea to wipe them off weekly with a rag. Place the units inside separate pockets on a pair of pants, or in separate thick socks. This will help reduce additional stress from being applied to the units in a horizontal axis machine. If the Magnetic Laundry System ever fails to perform, simply send them back to us and we will repair or replace them. Warranty is voided if balls are used for any application other than laundry usage or used contrary to label recommendations and cautions.. The Magnetic Laundry System balls are not toys. Keep them out of the reach of children. I'm very pleased with the Magnetic Laundry System; thanks for offering it. I could see how dirty the water was in the washer, so it's obviously doing a terrific job of cleaning. Also the clothes have no smell when removed, compared to before. thanks again! We're extremely pleased with the Magnetic system. We gave an extra system to my mom and didn't tell her anything about them, only to try them. She was so astonished that she told my uncles, grandmother, aunts..... etc etc. she is now passing them around to the various families, so there will be quite a few more purchases from us in the near future.